The Credit Crisis starts its Second Year. A Washington Post article dated August 22, 2008 titled “Bad Begets Worse” describes a “giant negative feedback loop” in the financial market that may cause the global economic engine to seize up . Declining housing prices send a signal to potential buyers to wait for the market to bottom out. While they wait for the market to bottom, there are more foreclosures and additional losses to financial institutions, who then become less and less able to make credit available, commercial or otherwise, and the cycle reinforces itself all over again with each leg of the downward spiral. Former Chairman of the Federal Reserve Alan Greenspan wrote in The Wall Street Journal in December 2007 that that the “current credit crisis will come to an end when the overhang of inventories of newly built homes is largely liquidated and home price deflation comes to an end” . We need the housing market to bottom out first so that we can break the negative feedback loop and get back to business. 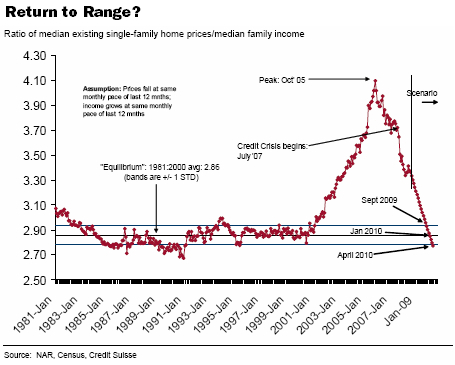 According to economists at Credit Suisse, extensive analysis of several home-price indices and metrics reveals that we will not see equilibrium in housing prices for 12-18 months, or late in 2009 as shown in the graph below. This is the point at which they think the “median existing-home price to median family income” ratio, a key metric from the National Association of Realtors, will reach the narrow range it had before the housing bubble began . How is it going to end? Lessons From the Asian Crisis 1997-1998. Greenspan also said that the current crisis is “identical” to the ones that occurred in 1987 and 1998 , so let us look at the Asian Credit Crisis of 1998 to see if we can predict how the rest of the current crisis will play out. There are many ways that the two crises are similar. Banks and borrowers were over-leveraged, assets were over-valued (real estate), and when prices stopped going up and started to fall, declining collateral for loans and large losses caused widespread bank failures . Norman Villamin, Head of Investment Research and Strategy for Citi Private Bank in Asia-Pacific, reminds us that how the crisis is going to end is more important than when. According to Villamin, “the keys to the end of the Asian crisis centered on three areas: recapitalization of the banking system, de-leveraging of borrower balance sheets, and recovery in a demand source” . Go ahead and place a check mark by step one with the US Treasury takeover of Fannie Mae and Freddie Mac on September 6, 2008 . In addition, recent economic news in the U.S. points to exports being the sole economic element driving growth in GDP at this time . It may not be enough to drive us through a credit crisis, but seeing U.S. exports rise is something of a surprise to everyone. As for de-leveraging of borrower balance sheets, Gary Wolfer, who is chief economist at Univest Wealth Management & Trust, says he “doesn’t think things are going to go back to normal” because the U.S. economy is shifting from a reliance on debt and consumer spending to an emphasis on saving and exports . According to Wolfer, this will be a long and painful process for the US. On September 15, the failure of Lehman Brothers and the dire liquidity crisis faced by insurance giant AIG triggered a 4.5% decline in US stocks — the worst trading day since September 11, 2001. Economist Nouriel Roubini, who has been right on the mark about the credit crisis for over 2 years now, predicts that Morgan Stanley and Goldman Sachs are next, and that the business model of the independent broker-dealer that borrows short-term overnight and employs enormous amounts of leverage is permanently over: http://www.cnbc.com/id/15840232?video=856040747&play=1. Roubini’s comments have sparked vigorous debate in Wall Street circles about the viability of the independent broker-dealer model, just as the Federal Government approached Goldman and JP Morgan and asked them to provide a $75 billion line of credit to AIG. If all that seems confusing and contradictory to you, then you’re paying attention . . .
Changing the average consumer’s spending behavior is a process that will take time and discipline to achieve. If U.S. citizens could follow the household savings rate of average consumers in other countries, it would be a change in the right direction. Personal savings figures for France and Germany are over 10% (http://perotcharts.com/2008/05/household-saving-rates-for-selected-countries/?cp=all), and India has a household savings rate of over 20% (http://www.iht.com/articles/2007/05/07/business/sxmuk.php). A fundamental shift in how U.S. consumers perceive saving for the long term is necessary to achieve an increased rate of savings. Educating the average consumer through informative postings is a great start toward achieving the objective. Nicely written article. I agree with your point that for the housing market to turn, inventories of homes must largely be reduced or liquidated. The supply of homes on the market is increasing while sales are diminishing. The following website provides sales and inventory of homes and condos over the last four years. http://www.nahb.org/fileUpload_details.aspx?contentID=55761. In 2004, about 1.2 million new homes were sold, while the inventory was around 400,000. More importantly, there was around 4.1 months of supply of new homes on the market in 2004. This number has grown to 10.1 in 2008. Similarly, there were 4.3 months of supply of existing homes in 2004. That number has grown to 10.6 months in 2008. This pattern is detrimental to the U.S. economy and the results are being felt. Consumers are feeling less confidence in the economy and are more skeptical of borrowing. As you imply in the article, the future is uncertain. It is hard telling where the housing market will go from here. Carolyn, excellent posting, a very well-written, direct synopsis of the current situation. I especially like your reference to Gary Wolfer’s quote regarding the requisite, “painful” shift from a nation of debt and spending to one focused on exports and saving. Like Josh, I couldn’t agree more. Since WWII, the US has cultivated a gluttonous ‘shopaholic’ mentality, fueled by cheap money and cheap energy. In fact, since 1965, the consumer spending rate in the U.S. has only contracted (i.e., less spending in a subsequent year than the previous year) twice, despite the half dozen or so recessions during that period. With the culmination of high energy prices, inflation, credit contraction, job reductions, and the entire current economic situation, Americans really have no choice but to begin deleveraging their individual balance sheets. This is not necessarily a bad thing, however. Although the process will most likely be painful for many and we will probably see an intense period of economic strain, at best, the result will (hopefully) be more conscious, more efficient, and more prudent consumers. Hopefully. The credit crisis ends when banks have confidence in lending to consumers, businesses and one another. That’s going to take some time. The average recession post-WWII has lasted 10 months. The current one could last almost twice that long, given the confluence of negative factors battering the global economy and financial markets. You really make it seem so easy along with your presentation but I to find this matter to be actually something that I think I might by no means understand. It sort of feels too complicated and very large for me. I’m having a look forward to your subsequent submit, I?ll try to get the cling of it!